The great attraction in growing perennial flowers is that you never have to replant them, at least in theory. This doesn’t make all perennials care-free, though. Few of them let you just sit back to enjoy them year after year once they’re planted. Take coreopsis, for example, a wonderful perennial that ends its first flush of bright yellow blossoms around midsummer. Like a number of other perennial flowers, coreopsis can be overly exuberant in some gardens — mine, for instance. Right now, the plants are threatening to take over the whole flower bed in which they were planted. Coreopsis spreads very effectively by self-sown seeds and by roots that travel underground and then send up shoots (“suckers”) some distance from the mother plant. Both seedlings and root suckers are beginning to elbow out dianthus and other more sedate neighbors. [post_ads]Agastache (sometimes known as anise hyssop), also in that bed, is one plant that can stand up to coreopsis. As a matter of fact, agastache is so aggressive that I might call it a weed, tempting me to remove it altogether once and for all. Like coreopsis, it spreads by seeds and suckering roots. As I pull on those licorice-minty stems, though, their aroma beckons me to leave in at least a few plants. I give in. If I did want to plant more of any of these perennials, those dislodged stems re-establish quickly at a new site or in flower pots to plant out later. Oriental poppy is another perennial needing some attention in summer. Excess plants may need to be weeded out, but — more important — this plant needs tidying up. Oriental poppy dies back in summer, so I cut back the sad-looking, dying flower stalks and leaves and cart them over to the compost pile. I mentioned that dianthus is well-behaved, yet even this plant needs some attention. Shearing back the stems now that the first flush of bloom is past helps coax another flush of bloom this season or, at least, better bloom next year. Shearing stimulates growth of new, flower-bearing stems and diverts energy that otherwise would go into ripening seeds to new growth and blossoms. 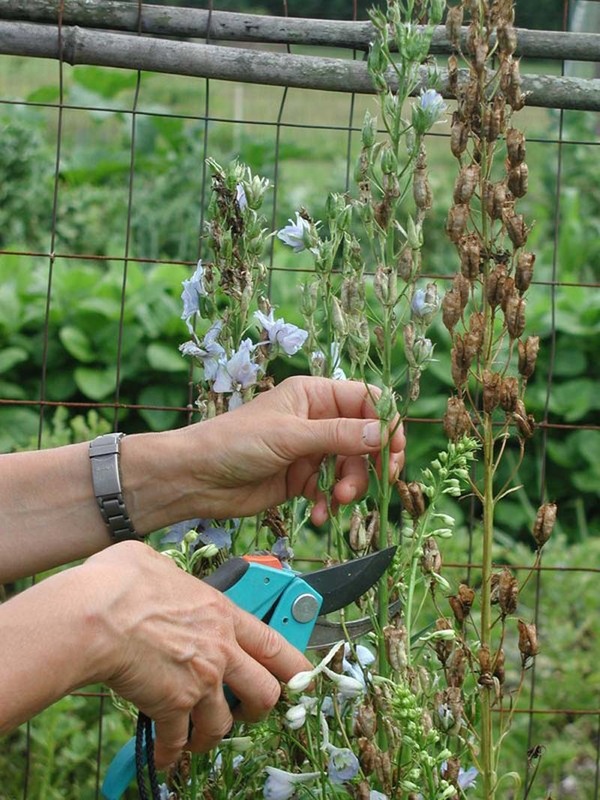 Thwarting seed production also prevents at least one means of spread — by seedlings — of some perennials. Shearing is useful for creeping stems, but cutting back individual flower stalks is the treatment for clump-forming plants. Other plants slated for shearing or cutting back include snow-in-summer, delphinium and columbine. A few perennials do live up to gardeners’ hopes of a plant you set in the ground and then do nothing more than enjoy. Some that come to mind are peony, daylily, hellebore and hosta, all with dense enough foliage to even shade out most weeds. Baby’s-breath and butterfly weed are perennials that also rarely need attention but don’t have dense foliage to shade out weeds. Keep them weeded.